It’s snowing this morning. Peaceful still snow. Sometimes big flakes, sometimes tiny, but the air is still and a quiet trickle of snow falls outside. It’s as if we’re all inside some quiet, gentle, still place. Looking out the back window as I did the breakfast dishes I saw a woodpecker on the birdfeeder — since my cat died last fall, I finally felt I could get a birdfeeder (Patsy in her prime was quite a birder. She once caught a hummingbird and brought it to us when we were barbequeing on my front porch in Salt Lake — as if we’d put her little hummingbird on the grill with the chicken). Since I put the feeders up, I’ve kept the The Sibley Guide to Birds next to the toaster, where I can grab it quickly. This isn’t the first time I’ve seen the woodpeckers. I’d looked them up before and I figured it was either a Downy or a Hairy woodpecker, but because I’m really bad at estimating size (I can’t tell you for example, how many yards away anything is — yards, inches, feet, they’re all just too abstract) I wasn’t sure which one it is. I went back to the New York Times online and when I got up a few minutes later, there was a much bigger woodpecker on the suet cage. 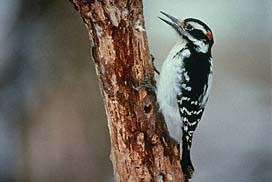 It had bright red patches on it’s head and I pulled out the bird book — that was the Hairy woodpecker! It’s significantly bigger. It hung around for a couple of minutes, just long enough for me to get a good look at it, then off it went, flying through the snowflakes.